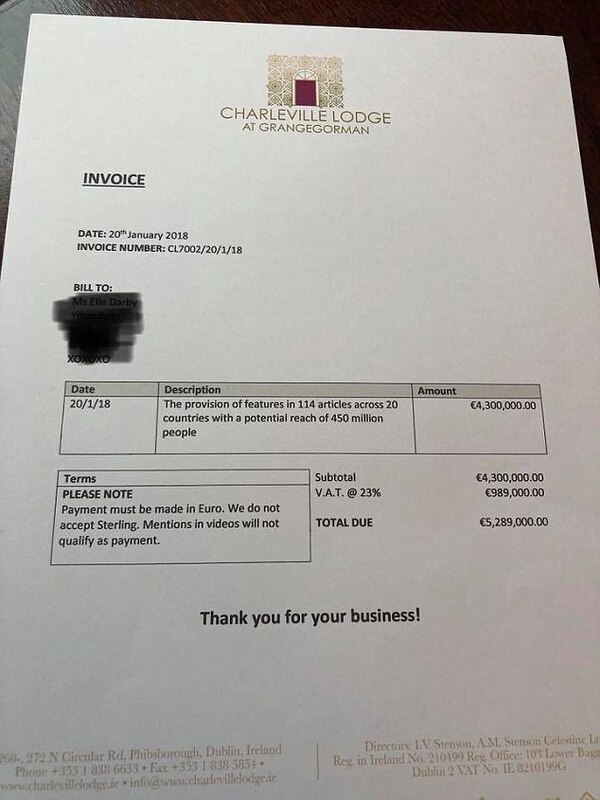 The Dublin hotel accused of 'bullying' a YouTube vlogger who asked for a free stay in exchange for a positive review has invoiced her nearly €5.3m for 'publicity'. 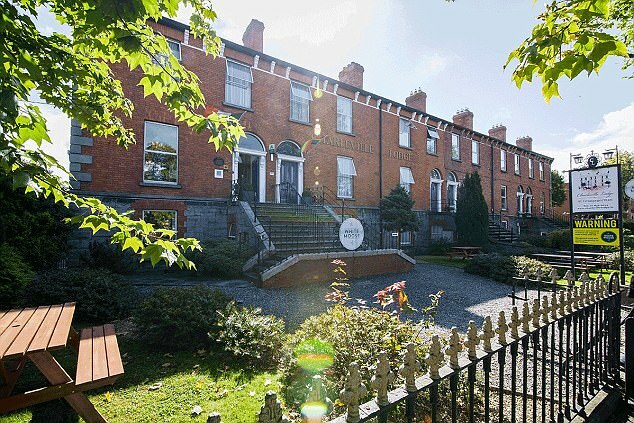 Elle Darby, 22, of Bath, Somerset, wrote to Paul Stenson, the owner of the White Moose Café and Charleville Lodge Hotel in Dublin and asked if he would like to 'collaborate'. 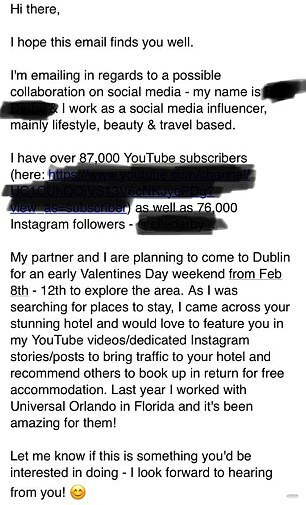 'I would love to feature you in my Youtube videos/dedicated Instagram stories/posts to bring traffic to your hotel and recommend others to book up in return for free accommodation,' she wrote. But her note was greeted with disdain by Mr Stenson, who not only poured scorn on the request but also posted the exchange online. Mr Stenson, who famously barred vegans from his cafe in 2015, did not identify Ms Darby in his post, but Ms Darby outed herself after spotting it online and seeing the comments it attracted. 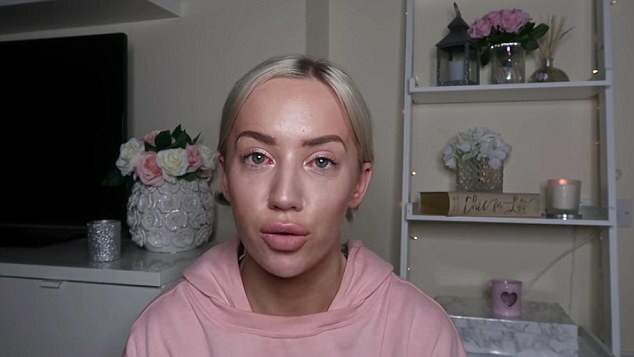 The hotel and cafe proprietor has now sent Ms Darby, who has 87,000 YouTube subscribers and 76,000 Instagram followers, an invoice for the publicity she has received in the wake of their exchange going viral. The invoice states that she is being charged for 'the provision of features in 114 articles across 20 countries with a potential reach of 450 million people', and that the publicity Mr Stenson has obtained for her would be valued at €4.3m plus VAT. 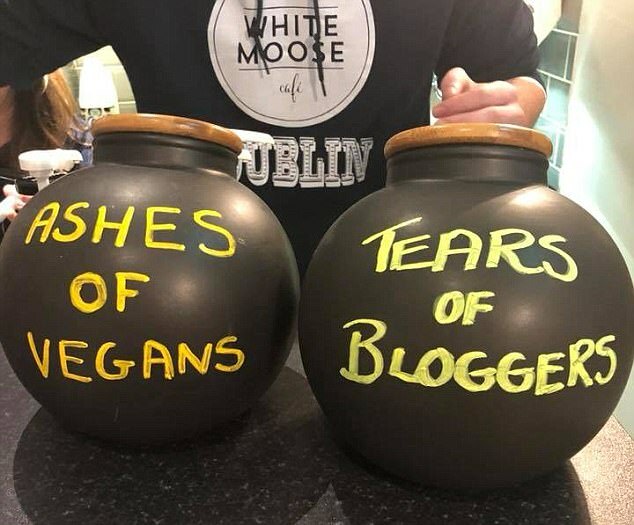 He also posted a picture of a jug containing 'tears of bloggers' after getting attacked on social media when he posted his email exchange with Ms Darby online. 'Thank you for your email looking for free accommodation in return for exposure,' he said. 'It takes a lot of balls to send an email like that, if not much self-respect and dignity. 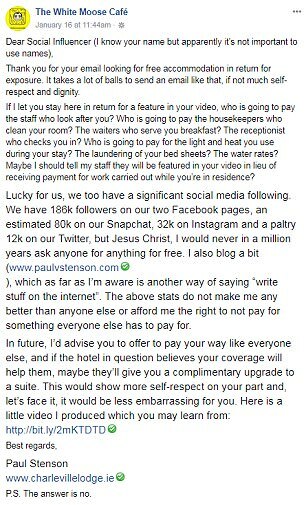 'If I let you stay here in return for a feature in your video, who is going to pay the staff who look after you? Who is going to pay the housekeepers who clean your room? 'The waiters who serve you breakfast? The receptionist who checks you in? Who is going to pay for the light and heat you use during your stay? The laundering of your bed sheets? The water rates? Despite not being names in the post, Ms Darby responded by posting a video on her YouTube channel, with the title: 'i was exposed (SO embarrassing)'. In the video, she claimed people over the age of 30 'had no idea how social media works these days' and revealed she had received hundreds of messages of abuse. 'I feel disgusting having to say this. As a 22-year-old girl, who's running her own business from her home, I don't feel like I did anything wrong,' she said. Ms Darby also claimed the response was hindering 'the younger generation from doing what they enjoy' and that she 'cried my eyes out in my car alone'. Mr Stenson wrote: 'I never thought we would be inundated with negative reviews for the simple reason that somebody was required to pay for goods received or services rendered. 'The girl in question was never identified in my original post, but she herself went on to create a video explaining how she was 'exposed' with 'malicious intent' for asking for a freebie. 'This kind of victimisation is very prevalent in the blogging industry, and is in keeping with their general modus operandi of wanting everything for nothing.